I know that I have been talking here about having a hard time with depression lately but it isn't all the time and today was one of those days that was just filled with little joys. It's a long weekend here, which immediately makes it better and then, on top of that, I got to have a marvelous day with my family. Our plan had been, and it worked, to go to the Farmer's Market in the morning, early. Both kids love Crocs and I refuse to pay full price. There's a place at the market that has them cheaply and when we go, the kids get to see all the animals. We knew that we had to be back since Dh was meeting some children on his soccer team for their jerseys so we didn't linger. We took Chelsea along, since we knew she would have a wonderful time. Another wonderful part of the day was going to pick up our CSA share. I LOVE doing this. We get veggies and eggs bi-weekly (weekly in the summer), 3 lbs of pork once monthly and 8 lbs of beef, again, once monthly. When the summer starts, we'll also get a chicken a month and a hot house share a week. 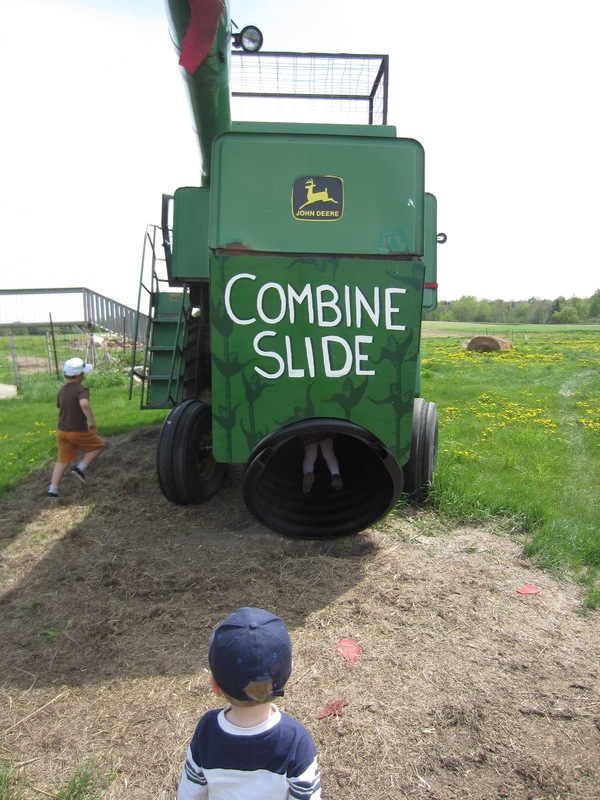 I love talking to the people who grow my food, knowing that what I pay is going directly to the farmer and not to a string of distributers and I love that my kids get to play where there food is grown. It's been fun, for me who loves to research, to learn how to use some of the cuts we aren't familiar with and to incorporate new veggies into our diet. 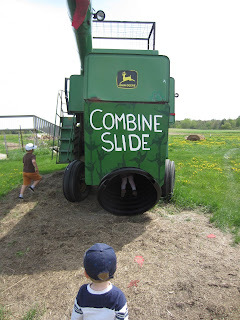 Today was extra special since we met up with good friends who also were picking up their share and the kids played on the combine slide, swings and we had a good look at the animals. The rest of the day was just spent as a family and I couldn't have enjoyed it more. We have a major garden project we have undertaken (photos to come in another post) and so we spent much of the day buying plants, working outside and admiring our work. We have some mosquito bites to show for it and I definitely got more sun than I should have but we are all going to bed feeling a bit more ownership of home and that we got to spend a wonderful day together.